In Pantoland absolutely anything is possible (oh no it isn’t..) – and there was nothing closer to the truth than in this sparkling production of Britain’s favourite panto. This delightful version of Cinderella at the magnificent, intimate, Stiwt Theatre, in Rhos, even manages to weave the theme from Ghostbusters into the plot as the laughs come thick and fast. LHK Productions have certainly hit the jackpot with a slickly-delivered show crammed full of great songs and some memorable performances by a cast who clearly love their “work”. The sets are excellent and wouldn’t look out of place in a high budget West End blockbuster, particularly Prince Charming’s palace. 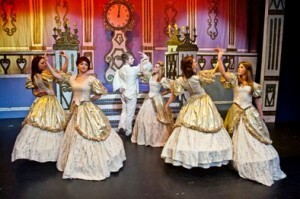 The glitzy, colourful costumes will have your heads swinging left to right in explosions of colour. To add a further wow factor (or arghhhhh factor) comes when the two snowy white Shetland ponies pull Cinderella’s coach on stage in a scene-stealing miniature equine extravaganza, all adding a magical atmosphere to the glittering evening. The squeals of delight from children in the auditorium is almost drowned out by the mums (and Dads) – hearts melting in delight – sighing as Cinderella’s coach, illuminated with hundreds of sparkling fairy lights, arrives centre stage and brings back those reminiscent memories. 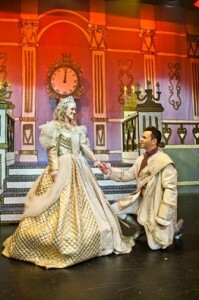 Subtle lighting adds to the scene as Cinderella, encouraged by her Fairy Godmother, takes her seat in the coach. There can be little doubt should there be a nationwide award for top panto scene the trophy would be already in Theatr Stiwt‘s trophy cabinet! Alison Crawford, who made the semi-finals of Grease is the Word, Simon Cowell’s search to find a Sandy for London’s West End show, is superb in the lead role. She’s clearly a huge hit with younger audiences and thanks to her stunning good looks she’ll have a few male hearts racing too. Not that mums miss out as Big Brother beefcake, Dale Howard who plays Dandini, manages to end up shirtless and showing off a six pack most men would die (or lie) for. 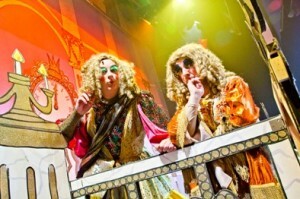 Most of the belly laughs come from Ugly Sisters Tracey and Stacey, played by Michael Chapman and Steve Davies who bear more than a passing resemblance to David Walliams and Matt Lucas. Michael Chapman, who is also the cast director, has to be just the funniest Dame I have ever seen. His comic timing and delivery are impeccable and from the moment he and his side-kick Steve Davies make their first appearance in their outrageously funny costumes they connect with younger members of the audience. 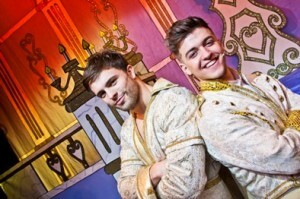 Heart-throb pop star Andy Scott-Lee is perfect as the quintessential Prince Charming and, thanks to his fine singing voice, undoubtedly wows a few ladies in the audience as well as Cinderella. There is a real chemistry between Scott-Lee and Crawford producing heart-felt believable duets. As he holds Cinderella in his arms and belts out Real Thing’s 70’s smash You to Me are Everything you get the feeling he really does mean it, as did most men in the audience! Big Brother’s Nikki Grahame is a beautiful as the Fairy Godmother and her strong southern accent adds a touch unintentional humour to her perfectly pitched performance. The musical content is a veritable time machine with hits from the 70s and 80s, together with the odd rap and a manic, and very funny, version of The Twelve Days of Christmas. that definitely gets the audience wondering if the antics are rehearsed or spontanious. However, one of the funniest scenes of all sees the Tracey and Stacey, the Ugly Sisters, and Dandini belting out Ray Parker Junior’s 1984 hit Ghostbusters while comedy chaos occurs all around them. In addition there are six top dancers, including stunning up-and-coming local girl and Hammond School Chester pupil Olivia Houghton, who perform some fabulously choreographed numbers supported by dancers from several local dance schools. 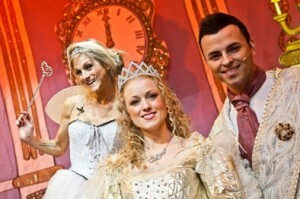 This really is a fabulous traditional panto performed in a wonderful, atmospheric old theatre with great acoustics. Forget £50 West End shows! A great night out with the family and change in your pocket at Theatre Stiwt – surely this is what Christmas is all about! …and so you should be! A great performance by the next generation of entertainers! Merry Christmas! Editor. We’re so proud of all the girls taking part in the Panto at the Stiwt this year, they’ve worked hard and tirelessly, often taking days off school to rehearse & perform. 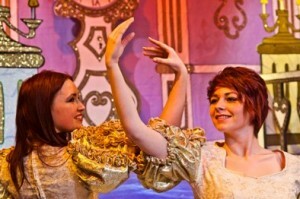 It’s an excellent Panto this year, and the quality of the writing, singing and arrangements are fantastic. North Wales Theatres, its intimacy makes the symbiosis between the cast and audience a very special one, and we’d highly recommend catching at least one of the performances before it finishes on the 2nd January 2011. We’ve seen it 3 times already, but hey….we’re proud parents to Beth (North Wales School of Dancing). Well done hun in your 1st full Panto – and thanks to all the crew, cast and fellow dance schools for putting on a most memorable performance. Hanna, many thanks for your comments. Updated accordingly. Editor. 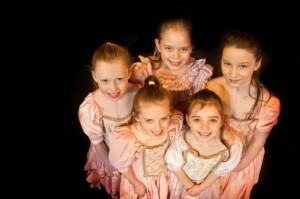 Olivia Haughton is not the dancer who is with Victoria Rees its local girl Hanna Medi Roberts.